As I’m sure the readers of this blog know, NMR spectroscopy is used widely across all branches of chemistry due to its powerful structure elucidation capabilities and the inherently quantitative nature of the technique. Organic relies primarily on 1H/13C experiments where as inorganic chemistry can expand to other nuclei, like 31P and 11B. However, there are many other applications for NMR other than just structural elucidation. Perhaps a lesser known application of NMR spectroscopy, is its ability to determine the isotopic ratio of elements! In this blog post I would like to demonstrate a method to determine the 10B/11B isotopic ratio using our NMReady-60e and 1H NMR spectra! Why not use boron NMR? Well, the problem is that boron has two NMR active nuclei, as we discussed in this blog entry , and one cannot see 10B in 11B spectra and vice versa. However, by using 1H NMR spectroscopy we can see different splitting patterns from the proton atoms depending on which isotope they are bonded to. For this experiment, the 1H NMR spectrum of NaBH4 in D2O is recorded on the NMReady instrument. The resulting spectrum is shown in Figure 1. Figure 1. 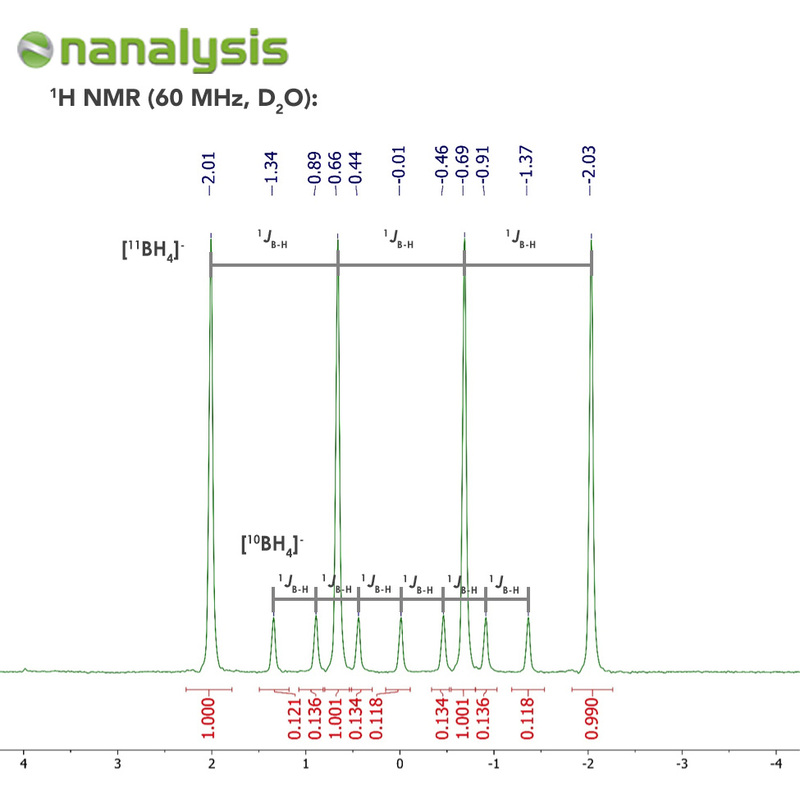 1H NMR spectrum of NaBH4 in D2O. As you can see, the spectrum consists of a large 1:1:1:1 quartet with 1JB-H = 80.6 Hz and a 1:1:1:1:1:1:1 heptet with a 1JB-H = 27.0 Hz, both centred around −0.01 ppm. The splitting pattern observed in the spectrum is due to coupling of the proton signals in BH4− with the 11B and 10B nuclei, which have nuclear spins of 3/2 and 3, respectively. This is a common phenomenon for these quadrupolar nuclei. Using the “2In + 1” rule, where I is the nuclear spin and n is the number of nuclei, it is easily determined that the 10B nucleus will split the proton signal into a heptet while the 11B nucleus will give the quartet. Due to the inherently quantitative nature of the NMR experiment, comparing the sum of the areas of the heptet (10B) with the combined peak areas of the quartet (11B) will give the isotopic distribution of the two boron isotopes. This results in an isotopic distribution of 18.35% for 10B and 81.65% for 11B which compares very well with the known ratio of 19.90% : 80.10%. While it is unlikely that this method could be applied to any other nuclei, this experiment provides an excellent introduction to isotopic ratio, coupling to quadrupolar nuclei, and a novel application of the NMR experiment beyond structure elucidation. b) Zanger, M.; Moyna, G. J. Chem. Ed. 2005, 82, 1390. Coursey, J. S.; Schwab, D. J.; Dragoset, R. A. NIST Atomic Weights and Isotopic Compositions Home Page http://physics.nist.gov/Comp (accessed July 2018).